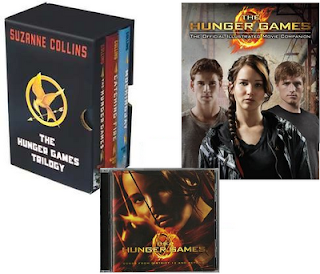 The Crazy Bookworm: It's here....The Hunger Games grand Prize giveaway! It's here....The Hunger Games grand Prize giveaway! Over the past 2 weeks I have been doing a giveaway leading up to the premiere of The Hunger Games...Well, The Hunger Games hits the big screen this Friday! So, as promised, here is The Grand Prize. *There are not extra entries for this giveaway. Just fill out the form, it's that simple! And while your at it, enter the previous 2 giveaways as well! Thank you for the Huunger Games Giveaways. They are all amazing. Only one more day!!! This is great! Can't wait for the film, going at midnight tomorrow!! I'm so excited for the movie. Thanks so much for this giveaway! I saw the movie but it has been awhile since I read the books. May the odds ever be in my favor! Hi just wondering, has there been a winner for all the giveaways? I'm still hoping I've won even though it's been a week now!